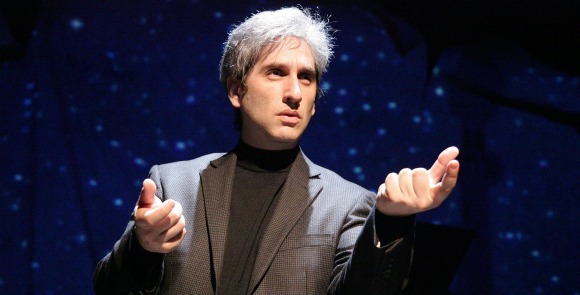 If Hershey Felder’s one-man show “Maestro: The Art of Leonard Bernstein” is viewed as an indulgent, affectionate riff on that greatest of American conductors and doomed-to-disappointment composer, it’s an appealing turn, a clever hour and 45 minutes of high-brow stand-up by an author-actor-musician who knows his stuff both theatrically and musically. Everybody in the packed opening night audience at the Royal George Theatre seemed to get a kick out of Felder’s Lenny. As a reliable perspective on the artistically multifaceted and psychologically complicated Bernstein, however, Felder’s theater piece is just too selective, romanticized, superficial and glib to be taken seriously. “Maestro” is the fourth in a series of such bio-gigs written and performed by Felder, who teaches music at Harvard University. He has also portrayed Gershwin, Chopin and Beethoven. As this Bernstein edition attests, he’s an assured actor, a splendid mimic, a good singer and an able pianist. To these may be added an adept writer. No doubt, Felder knows as well as I do what’s missing and what’s a bit skewed in his Bernstein story. He clearly admires his subject, and he’s made choices presumably in the interest of creating an easily digestible entertainment. It also must be said that “Maestro” offers a fair portion of provocative insight into this son of Ukrainian Jewish immigrants and his compulsion to be a musician – indeed, a composer, and a great one. Yet, despite a considerable output of music including three symphonies and several major stage works, Bernstein ended his days rankled by the certain knowledge that he would be remembered as the composer of just one thing, a musical collaboration with choreographer Jerome Robbins and a 26-year-old lyricist named Stephen Sondheim. In a tirade reminiscent of Peter Shaffer’s Antonio Salieri in “Amadeus,” Felder’s Bernstein rails against the perfidy of fate, dismissing “West Side Story” as juvenilia. 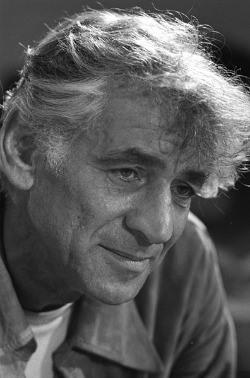 It’s that tension between Bernstein’s staggering success as a conductor and his constant frustration as a composer that essentially animates “Maestro.” And Felder pulls us seamlessly – and charmingly — into that dialectical struggle as he switches into very funny accented personas, abetted by photos on a rear scrim. Aaron Copland urges young Lenny to drop in on the daunting, dour conductor Fritz Reiner at the Curtis Institute of Music in Philadelphia (long before Reiner’s storied reign as music director of the Chicago Symphony Orchestra). Reiner, being Hungarian, naturally inverts his supplicant’s names, addressing him repeatedly in a high, whiny voice as Bairnschtein Lay-oh-nard. Lenny can’t cope with Reiner, who admits him into his class with the promise that he will fail, and turns to the man who will become his mentor and second father, Serge Koussevitzky, the lionized chief conductor of the Boston Symphony Orchestra. One of the show’s peak moments is Koussevitzky’s illuminating and cautionary instruction in the basic craft of conducting. Always look every musician straight in the eye, he warns – and pay particular attention to the trombone players, the troublemakers. Not the least fascinating accent is the one Felder adopts for Bernstein himself. We’ve just spent several minutes listening to the real thing, that distinctive sinusoidal baritone, in the video clip when Felder walks on and picks it up almost indistinguishably. Felder sets up his story with a rambling recollection of Lenny’s childhood with a loving mother and a practical businessman of a father, a devout Jew from the old country who declares that a career in music means a lifetime of eating crumbs. But there’s a neglected piano in the house and when the prodigious little boy discovers the sounds he can coax from it, his life is charted, crumbs or no. And in this reminiscence, Lenny recalls how the household was permeated with the sounds of Jewish music and how he began to see connections between this legacy and music as ostensibly far removed as a Beethoven sonata. Inevitably, Felder turns to another Jewish cultural and spiritual connection, Bernstein’s life-altering engagement with the music of Gustav Mahler. Seeing himself in Mahler, another great conductor whose music was largely spurned in his own time and a Jew who felt cut off from society, Bernstein takes it upon himself to champion the half-forgotten composer. Here we encounter one of the show’s genuinely touching moments as Felder’s Bernstein begins playing the Adagietto for strings from Mahler’s Fifth Symphony at the piano, then rises to meet and conduct the swelling recorded sound of orchestral strings. A similar, very beautiful episode occurs earlier when Bernstein walks in on the great conductor Dimitri Mitropoulos leading the sensuous Allegretto from Beethoven’s Seventh Symphony. What’s so moving isn’t only the remarkable coordination of music and gesture when we watch Felder-as-Mitropoulos leading the recorded orchestra; more seductive is Lenny’s electrified account of the miracle of seeing what this sublime musician could bring forth just by moving his hands in the air. Indeed, the more compelling part of “Maestro” is what might be called the making of Leonard Bernstein, his emergence into the world’s consciousness. (Felder’s tale of Bernstein’s epochal last-minute substitution debut with the New York Philharmonic in 1943 is a gem.) The middle stages and end of his life get painted in with a rather broad brush: his seminal music directorship of the New York Philharmonic (1958-69), his manifold and hugely important recordings, his political gambits, his volatile marriage to Felicia Montealegre. In this depiction, Bernstein’s homosexuality seems almost like a fling from which he sobered up. Still, Felder’s many characters are amusing and his story of how this American kid became Leonard Bernstein feels both personal and authentic. And in every musical respect, “Maestro” is, to be sure, spot on.